I love school supplies. Who doesn’t. And I have lots of teacher friends so I’m always trying to come up with fun teacher appreciation gifts. 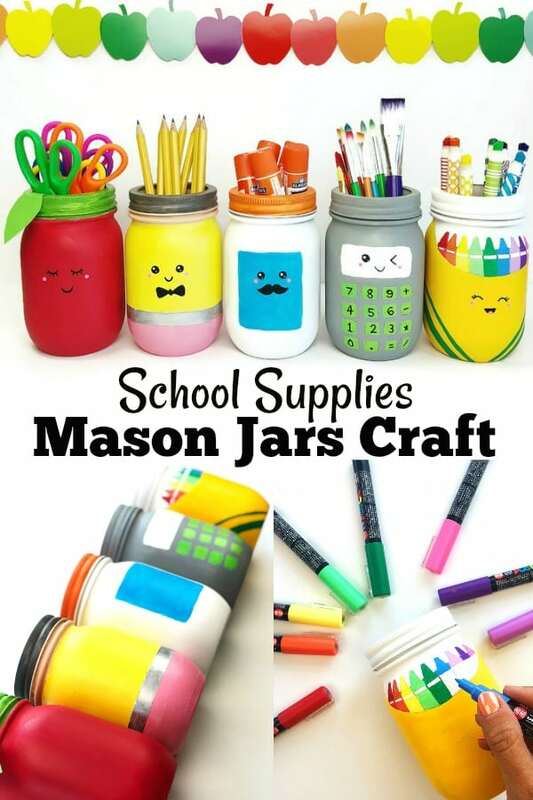 I’ve had the idea for this school themed mason jars craft for a long time, but summer has been non-stop with pool days, vacation days, lazy days on the couch, and lots of fort building and fort cleaning up with my son. 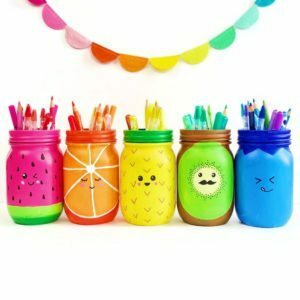 Now that I have a little time to craft, I finally had a chance to create my vision for this easy to make mason jar craft for school supplies. 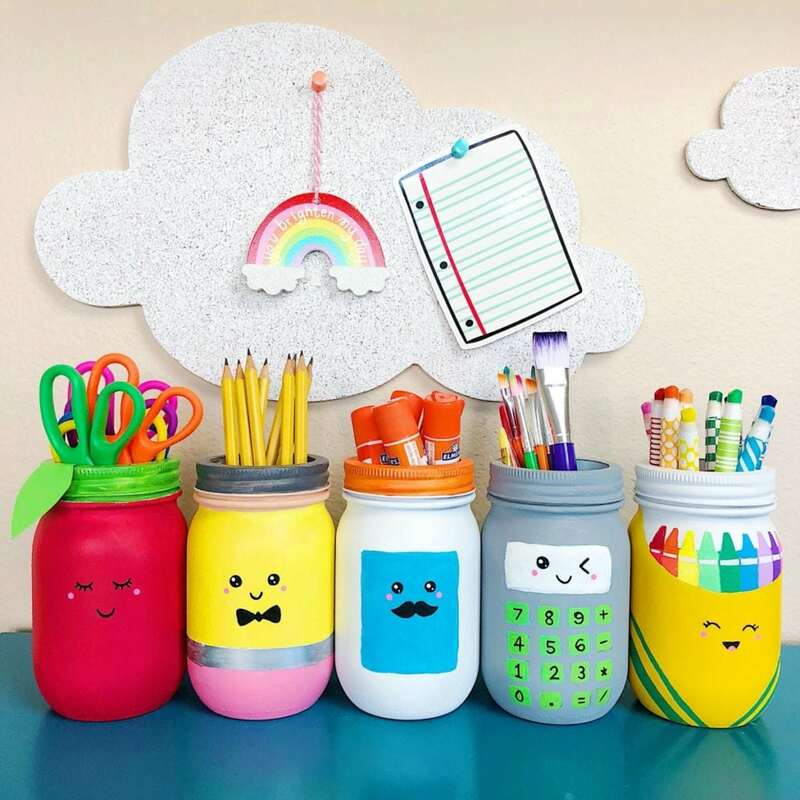 These school themed mason jars are perfect for storing all kinds of school supplies and they also happen to make for very cute desk accessories. 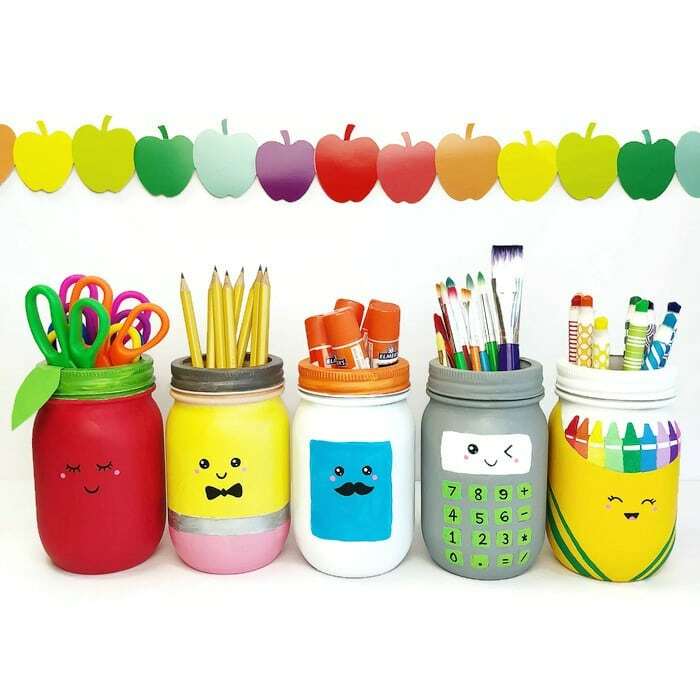 And when it’s time to go back to school, how adorable would these be to bring as new teacher gifts filled with supplies! Mason Jars – I use these 16oz mason jars because there’s a blank side with no logo that’s perfect for decorating. 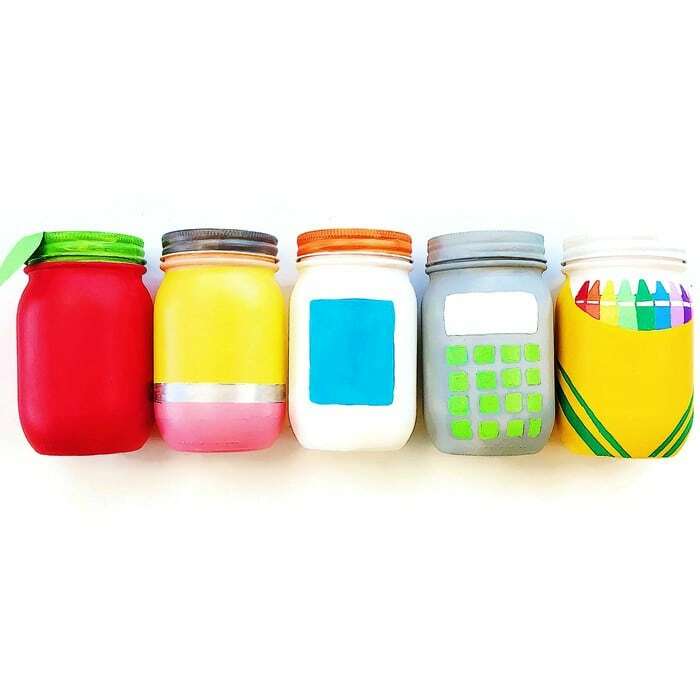 If you want something NOT BREAKABLE – use these plastic mason jars instead! Acrylic Paint – I really like the thickness of Folk Art acrylic paint for painting mason jars. Another good and less expensive option are Apple Barrel acrylic paints. 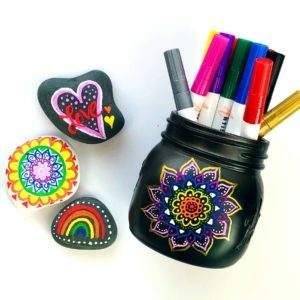 Paint Pens – If you don’t have Posca paint pens do yourself a favor and get some stat! I use them on most of my mason jar projects, as well as on rocks, wood and more. 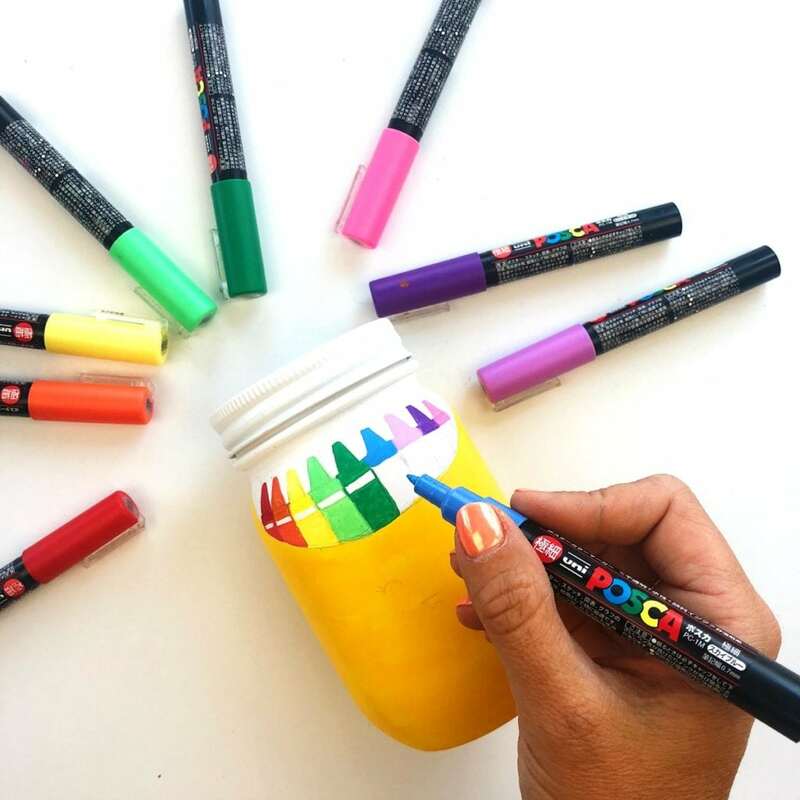 There’s also a full set of posca paint pens that has all the regular and pastel colors. 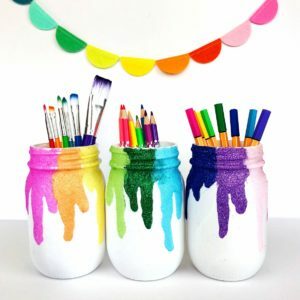 Paint Brushes – I like both foam paint brushes and flat paint brushes for covering mason jars with acrylic paint. Sealant (optional) – I often use this matte spray sealant or this gloss spray sealantdepending on if I want shine or a matte finish. Step 1: Spray your mason jars with a white, flat paint primer. Place jars mouth down on a piece of cardboard outside and spray evenly. You might need two coats of primer, but it dries very quickly. Step 2: Sketch out the more complicated designs with a pencil. You’ll end up covering where you draw the face with paint, but I like to sketch it out so I can see the placement of everything. 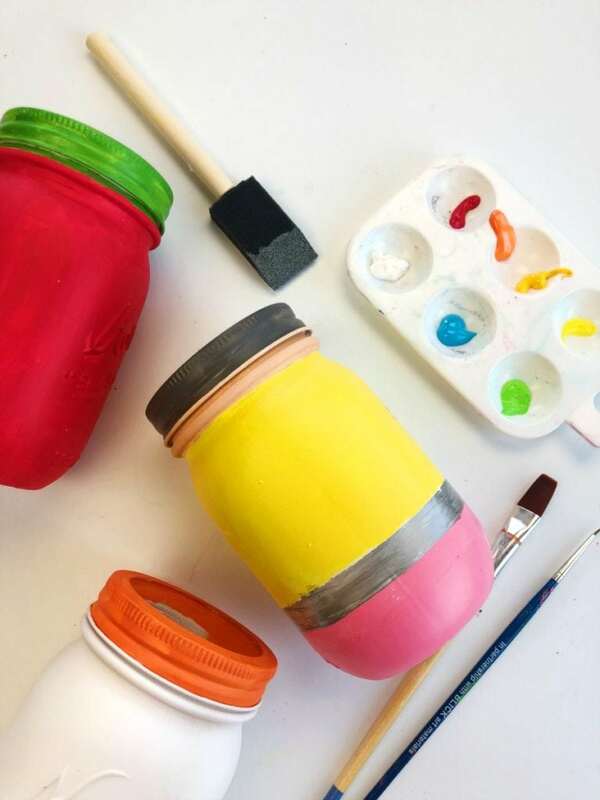 Step 3: Paint the mason jars using acrylic paint. You might need 2-3 layers of paint depending on the thickness of the paint. 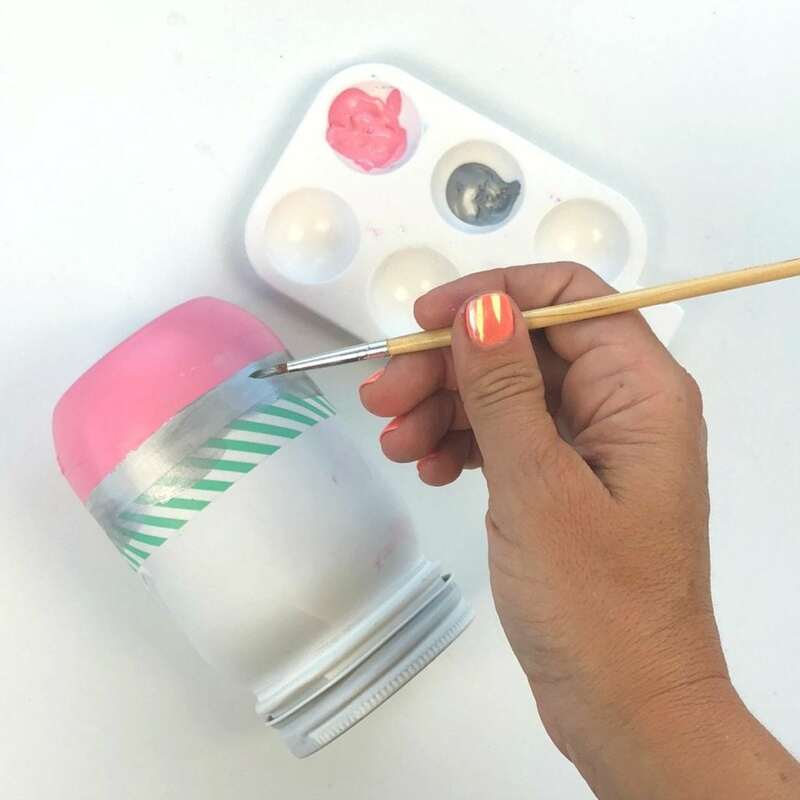 (NOTE):For any straight lines you are painting like on the pencil and calculator mason jars, you can use washi tape or painters tape. to help keep the lines straight. For the lines on the crayon box mason jar I drew them first with a pencil and colored them in with a paint pen. It was much easier than painting since they were thin lines. I also used paint pens to color in the colored crayons on the crayon box. 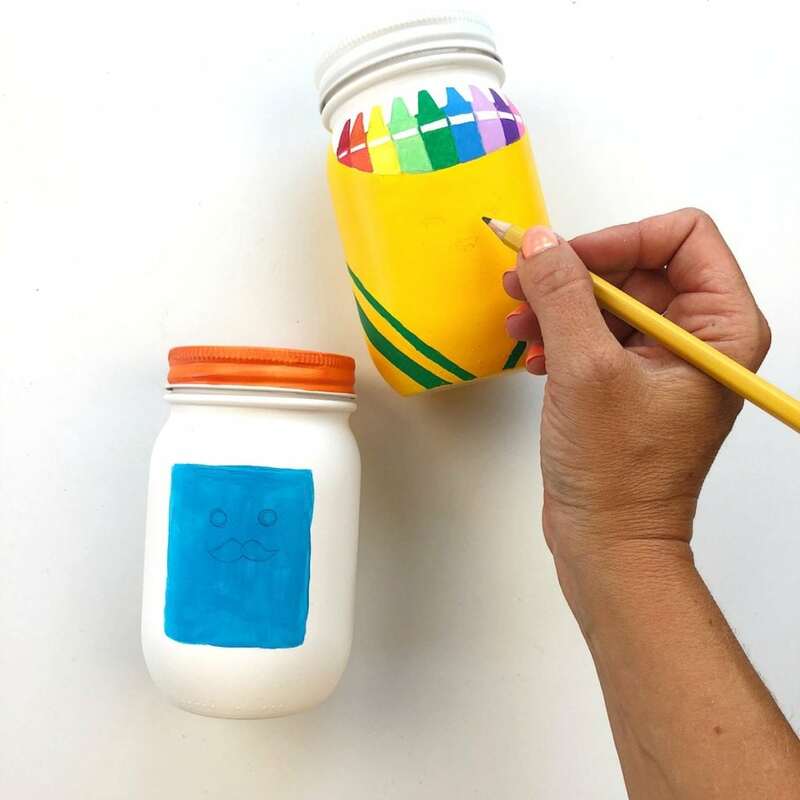 When working with small details on a mason jar, paint markers are key. 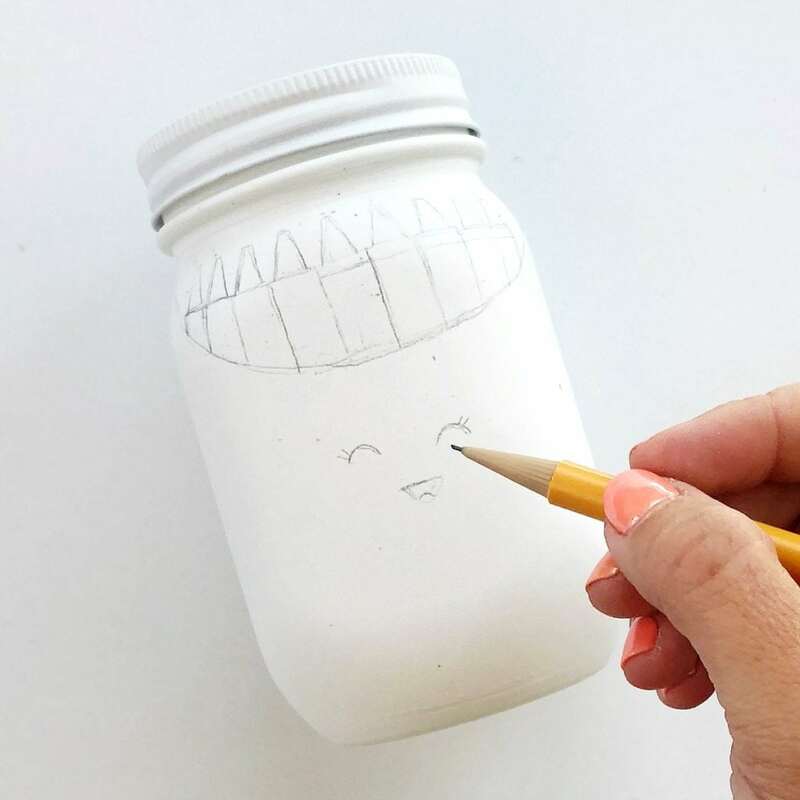 Step 4: Lightly sketch the facial features using a pencil on each mason jar. Step 5: Trace over the face outlines with paint pens. 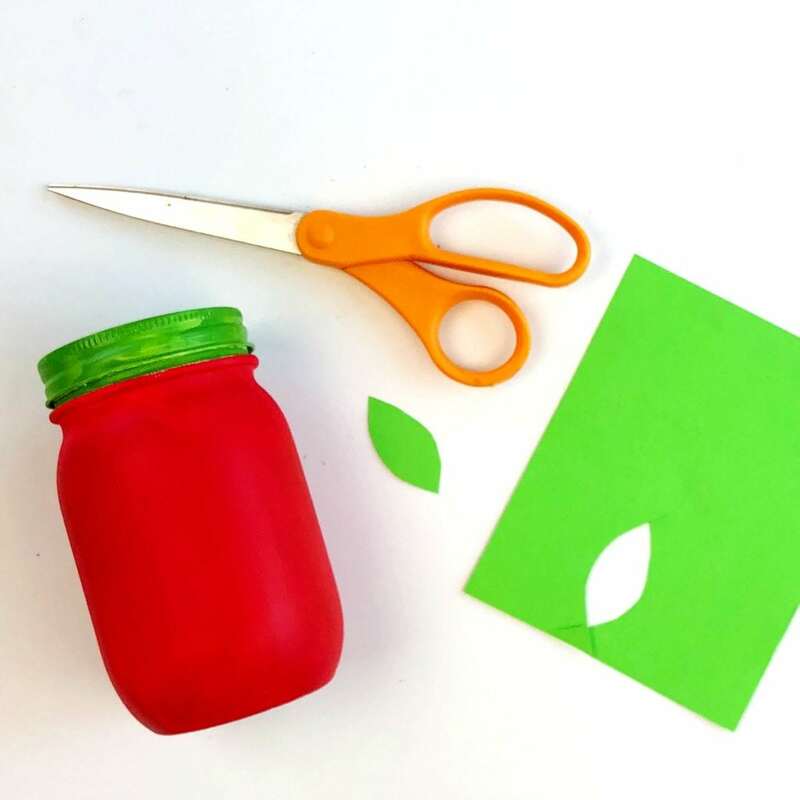 Step 6: Cut a leaf out of green card stock for the for the apple jar. Glue it onto the jar. Step 7 (optional): I don’t usually seal my mason jars, they have held up beautifully in my classroom. However if you do want to use a sealant it can help protect against fading and chipping. You just need to decide if you want a matte or gloss spray sealant. 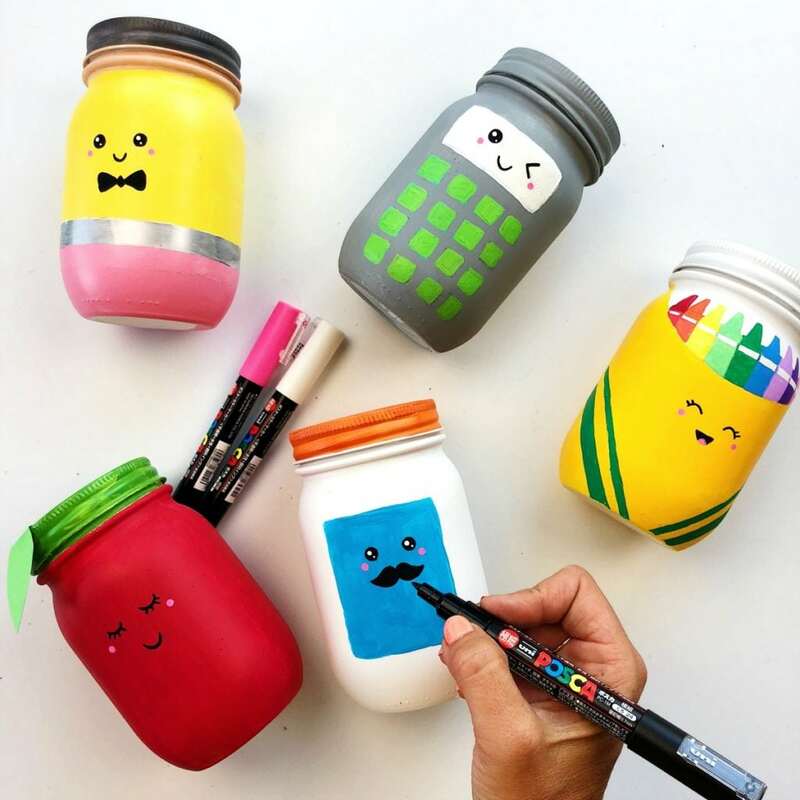 I love how these mason jars for school supplies turned out! They really would be great for teacher appreciation gifts, classroom decor, school supplies storage and back-to-school teacher gifts. 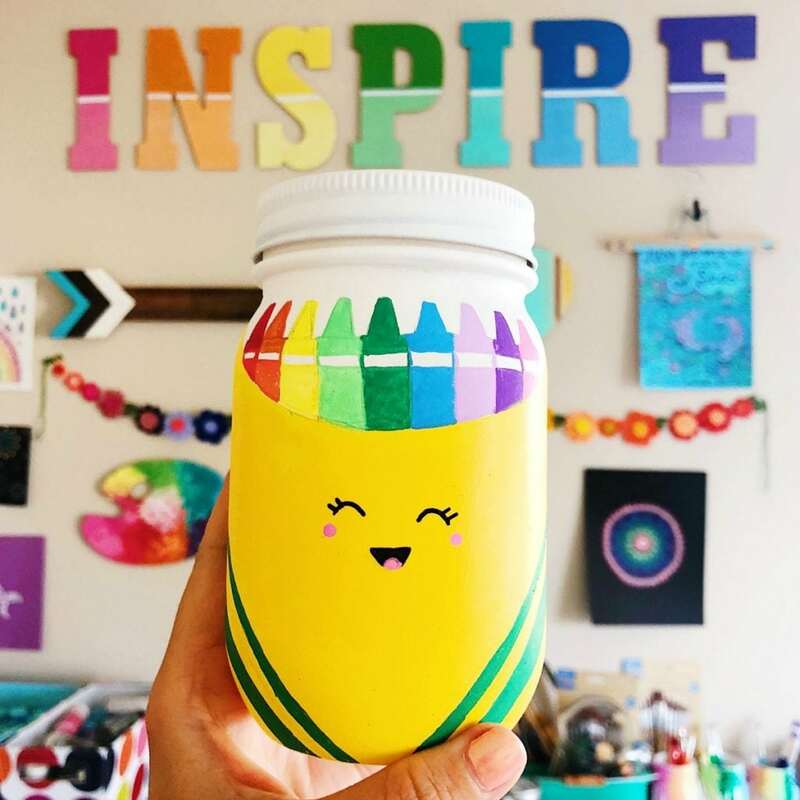 Hope you are feeling inspired to make your own school themed mason jars craft now! I’d love to see what you create. 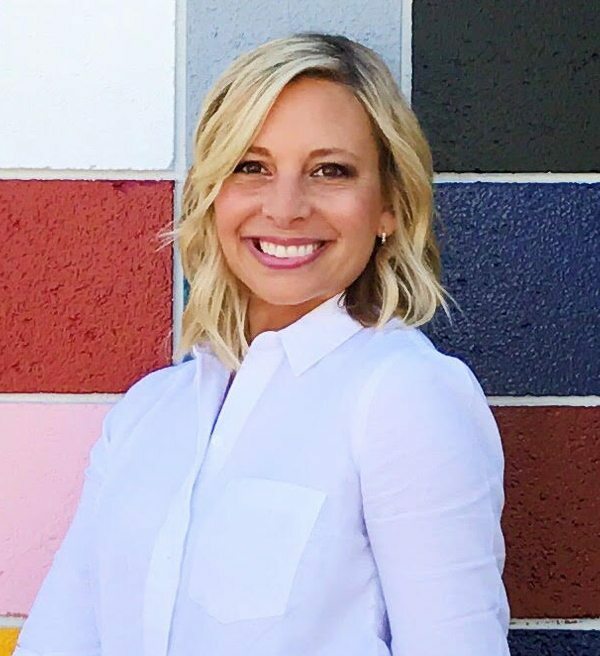 Come show me on Instagram or Facebook! I love to share examples of my tutorials being made! 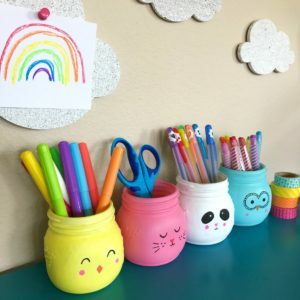 I love all of your mason jar crafts but I have to say that these are my FAVORITE!! LOVE, LOVE, LOVE!! Aww, thanks! I definitely love mason jars. They are such a great canvas! Do you make them to sell? 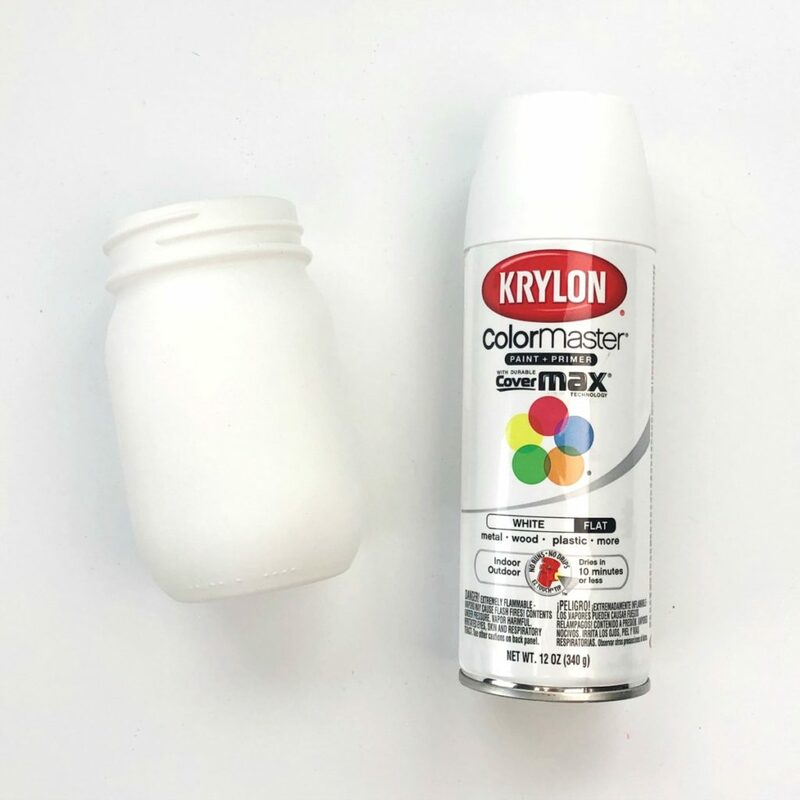 Do the mason jars have to be plastic in order to use the primer? The jars I used were glass but plastic jars would work just as well! These are super colorful and awesome Sam! great job ? Thanks Rodrigo! I had a ton of fun making them! These are insanely cute, thanks for sharing! They are precious. Do you sell them? These are so cute! How did you cut the top of each lid open? I want to make these but I worry about it being too sharp for my kids to touch! The jars I used (and linked to) have 2 pieces to the lid so there’s no cutting involved! I LOVE these ive decided to make some too, as a teacher! ? how long did you wait before painting after using the primer? The primer dries pretty fast. Usually in an hour. It should be dry to the touch.